Founded largely by Russian Mennonite immigrants, the city of Halstead was incorporated in 1877 and named in honor of journalist Murat Halstead. 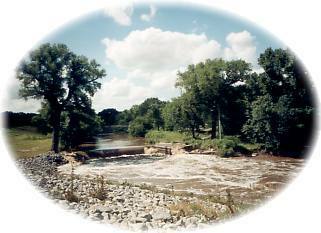 With the hard red winter wheat (Turkey Red) they brought from Russia, the Mennonites established Halstead as a farming community, and built the Bernard Warkentin Mill at the confluence of the Little Arkansas River and Black Kettle Creek. A famous "pow wow" between the frontiersman Kit Carson and the Native American Chief Black Kettle had taken place some years earlier at this same confluence. Greetings From HalsteadKansas.com! Since 1902, when Arthur Hertzler, the "Horse and Buggy Doctor", established his clinic and hospital, the city has been widely known for high quality medical care provided through the world-renowned Hertzler Clinic and Halstead Hospital. Halstead is home to the well-known and highly respected Kansas Learning Center for Health, formerly known as the Kansas Health Museum, which features Valeda, the talking glass lady. For many years, Halstead was "home" to a semi-pro baseball team, the Halstead Cowboys, and produced many fine ball players, including Larry Gura. Halstead is the boyhood home of the late Adolph Rupp, legendary basketball coach of the Kentucky Wildcats. Halstead is proud of its city parks, one of which has a "Hollywood" connection. The famous 1955 MGM movie"picnic" starring Kim Novak, William Holden and Cliff Robertson, was filmed primarily in Halstead's Riverside Park, located at the river confluence that marks the city's earliest beginnings. The Old Settlers Picnic, held in Riverside Park is the oldest continous celebration in Harvey County and has been held every August, rain or shine since 1887.